The Floating Net Boom is an economical containment option designed to help surround and protect intakes, aquatic plants, swim areas, debris locations and more. Built with a top flotation device and bottom net skirt, these boom have helped locations effectively deflect debris and prevent the spread of materials. All net boom provide easy access through the barrier, allowing water, particles and small marine life to pass through. 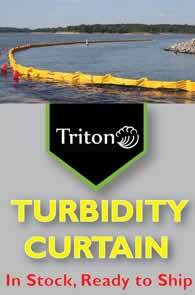 Section Lengths: 50 or 100 ft.
Debris Net Containment boom: Net Containment boom are constructed from standard PVC materials throughout the top flotation and freeboard. Connected along the bottom of the skirt is a marine-grade bottom net. This net works to exclude debris and jelly fish, allowing for the protection of intakes and other water areas. 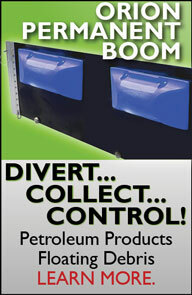 Standard boom are made in an 18" size with a 6" freeboard and 12" bottom skirt. Calm Water 22 oz. PVC 25', 50' or 100' 6" 12" 5/16"
Additional sizing and water options are available, so please do not hesitate to ask.